Extreme Backflow Can Lead to Discolored Water. Backflow represents a serious problem with severe consequences for your health. Backflow occurs when the flow within your plumbing reverses. Instead of waste traveling out of your pipes, it begins to flow inward. 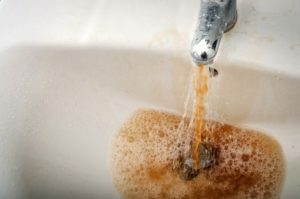 When you turn on your faucet, you will receive water contaminated with any number of pollutants. Sometimes, the contaminants will enter as trace amounts. When this occurs, you may not even realize you’re drinking polluted water. To prevent this distasteful problem, schedule backflow testing in West Los Angeles, CA from the experts at Sunset West Plumbing & Rooter Inc.. If you have never scheduled backflow testing for your home, then you’ve performed a major oversight on your health and safety. Consider the following, and call us today to schedule an appointment. Improved Health: As stated above, backflow can fill your water with contaminants that negatively impact your health. If you regularly suffer from ill health, polluted water may represent the reason. In particular, feces and bacteria can cause serious health issues. We recommend annual backflow testing to safeguard your health, as you may not even realize what your water contains. Prevention Strategies: Testing for backflow allows us to determine whether a problem exists. If it does, then we can install a backflow preventer to protect you and your family. These devices prevent backflow from entering your pipes, an invaluable safeguard. Backflow enters your pipes due to abrupt changes in pressure. These can occur either within your plumbing, or in the main line that supplies your house. Either way, the preventer device recognizes the change and activates to prevent backflow from entering your potable water. At Sunset West Plumbing & Rooter Inc., we are your local solution for backflow testing in West Los Angeles, CA. For any and all plumbing problems you have, give us a call today at (310) 454-2010. Posted in Uncategorized on August 8, 2018 at 8:53 pm by Sunset West Plumbing & Rooter.